10 cards in set. Each card is #/25. Click here for a complete gallery. Features 100 cards. Serial Numbered 1/1. 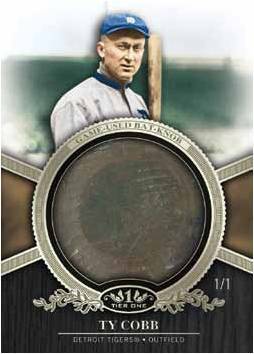 Click here for our 2012 Topps Tier One Bat Knob Guide and Tracker. 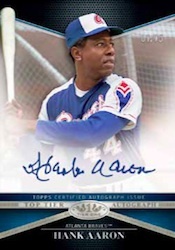 2012 Topps Tier One Baseball arrives as an all-hits release where everything is an autograph or memorabilia card. 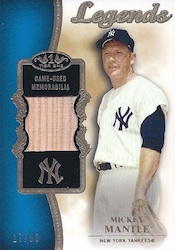 With no base cards in site, three-card boxes promise two numbered autographs and a numbered relic. Every fourth pack comes with an extra relic. 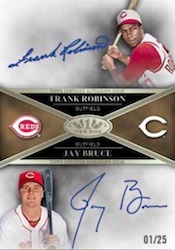 All single and dual autographs in the release are on-card, including relics and multi-signed cards. Offering a broad mix of emerging stars, veterans and retired favorites, both the autograph and relic checklists are big. While there are some huge names, such as Albert Pujols, Ken Griffey Jr. and Willie Mays, collectors should also expect some lesser stars. 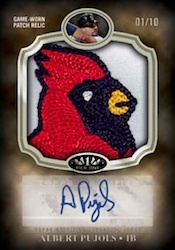 Highlights include Prodigious Patches, which feature jumbo swatches in both signed and unsigned versions, one-of-one Bat Knobs and case-hit Top Tier Autographs that include only superstars and Hall of Famers. 2012 Topps Tier One boxes come with three cards, all of which are hits. 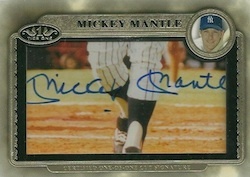 The first card is either a Crowd Pleaser Autograph, Multi-Autograph, Cut Signature or Autographed Relic. Packs also come with one On the Rise Autograph and one Relic Card numbered to 399 or less. One in four packs come with an extra Relic Card. 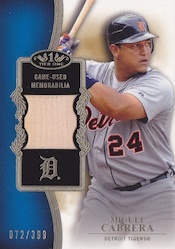 Some of the most discussed cards in 2012 Topps Tier One are bound to be the Bat Knobs. 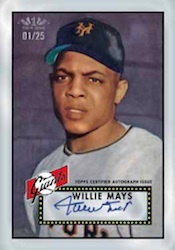 The checklist of 100 1/1 cards features players from both present and past generations. Top Tier Autographs (#/99 or less) are a case hit, falling one per 12-box case. Signers include Ken Griffey Jr, Willie Mays, Sandy Koufax, Nolan Ryan, Albert Pujols and many more top-end superstars and Hall of Famers. Parallels: White Ink (#/25), Silver Ink (#/10) and Gold Ink (1/1). 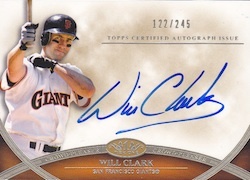 On the Rise Autographs (#/399 or less) highlight baseball's youngsters. The large checklist of 75 signers includes Jesus Montero as a Mariner, Michael Pineda with the Yankees, Eric Hosmer, Dustin Ackley, Mike Trout, 2011 National League Cy Young winner, Clayton Kershaw, and many more. Parallels: White Ink (#/25), Silver Ink (#/10) and Gold Ink (1/1). The Crowd Pleasers Autographs (#/299 or less) checklist is even bigger, with up to 90 signers. While there are some big names, such as Prince Fielder, Chipper Jones, Buster Posey, Andy Pettite and Joe Mauer, collectors should expect some lesser names as well. Parallels: White Ink (#/25), Silver Ink (#/10) and Gold Ink (1/1). Clear Rookie Reprint Autographs (#/25) see ten icon rookie cards redone on clear plastic. Signers include Griffey, Mays, Jones, Don Mattingly, CC Sabathia, Ryne Sandberg and Ernie Banks. Dual Autographs (five cards, #/25) and Triple Autographs (four cards, #/10) are all on-card. All 25 Cut Signatures are numbered 1/1. 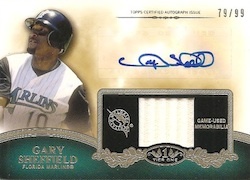 Autographed Top Shelf Relics (25 cards, #/99) pair autographs and relic pieces from both current and retired stars. Subjects include Pujols, Mattingly, Evan Longoria, Josh Hamilton, Gary Sheffield and Bruce Sutter. 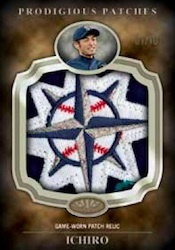 Parallels: Dual Patch (#/25) and Triple Patch (1/1). 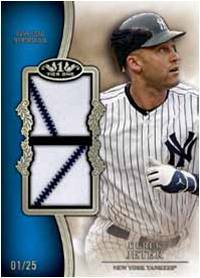 Prodigious Patches (25 cards, #/10) are highlighted by compelling jumbo patches. 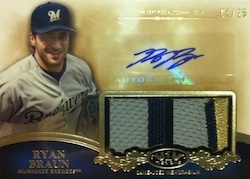 Autographed Prodigious Patches (ten cards, #/10) feature both a jumbo patch and an on-card autograph. 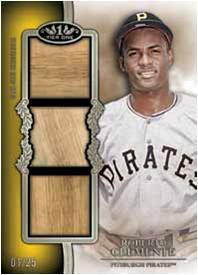 Top Shelf Relics (#/399) have an expansive checklist of 60 players. Parallels: Dual Swatch (#/99), Triple Swatch (#/25). 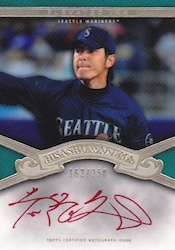 Elevated Ink Autographs feature Hisanori Iwakuma and Devin Mesoraco. Both signed in red, green, blue and black ink. 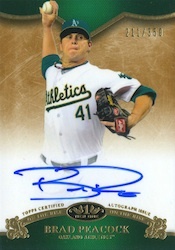 What Are the Most Valuable Cards in 2012 Topps Tier One Baseball? nice cards i would love to get a box of these cards..
With a relic AND auto in each of the 4 mini-boxes, LAST year’s Tier-One release was pretty weak due to the suspect checklist. This year? and I recognize that it’s only one box, but the Trevor Cahill /75 and Adam Lind /75 autos, with the 1-color Alex Rodriguez postage-stamp sized patch were incredibly disappointing for a 1-pack product that set me back $110. I will not buy this product again but you might if you are risk taker. and a bat knob in 2 boxes!!!! If I could rate it a hundred stars I sure would. Bob (ID 80561) � Congrats. Which bat knob did you get?